Peru for You: Peru: The craziness. This is a taxi I was in on my way to Huancayo. The driver had only been driving a few weeks, hence the accident. We spun out of control on a road that lined the top of a cliff/steep hill. 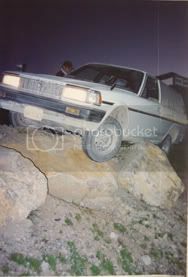 The car did a 180 and stopped finally with the tires literally suspended in mid air and all that was keeping it from tumbling down the hill was that blessed rock pinned in its side. This was taken on my way to a town called Huancavelica. We had every seat filled in the 5 seat taxi, plus all my luggage filling the trunk space. One thing about Peruvians is they don't pass up opportunities to make a little more money, which is understandable. 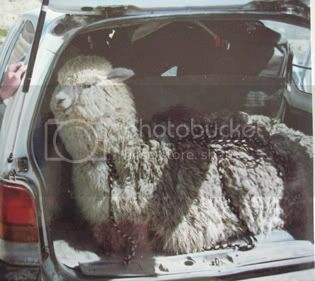 When the taxi driver saw two people and a llama on the side of the road he pulled over to pick them up. I wondered where he was going to put them since we already had a full car. No problem. One person rode up front, doubled up with another person in the passenger seat. My bags got rearranged and the llama got shoved up against them; and the other guy squeezed in back straddling the llama with his legs and holding the llamas head next to his. The driver slammed the trunk door and made 20 extra soles. these are some of the most random pictures i have seen. lol.